The major benefit of Majestri is the single source of truth for your club data. The fact that multiple people within the club can be given access to that data means that many hands do indeed make light work. We recognise that it can't be open slather though. People are elected to a committee are put in positions of trust, and are responsible for the running of the club in their respective areas of responsibility. This article explains the purpose of a committee in Majestri, and walks you through how to build one and control what each person on that committee can access in the system. In Majestri, we've designed the system concept of a 'committee' to match the reality of their existence in a nominal club. Just like in the real world, a committee is built once a year, with some people returning for another stint, and some people stepping down to be replaced by new volunteers. So it is in Majestri too. When you create a committee, it too has a lifespan that you can control. You can add your volunteers to the committee, assign them roles, set their access privileges, and know that once that committee 'expires', those people will revert to normal non-administrative privileges. 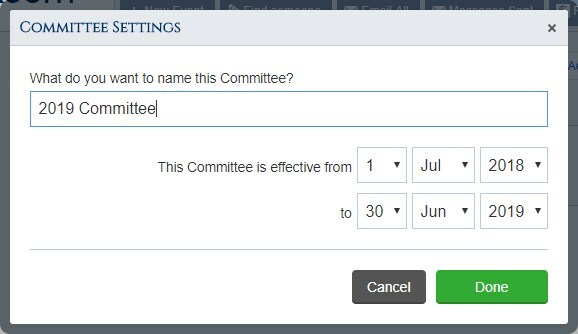 Majestri has been designed so that all past committees stay in the system, so rather than updating the same committee each year, you just create a new one and add your new personnel to it. In addition, a committee in Majestri is like any other type of 'group'. It's a set of related people that you can use for communication purposes. The access point for everything of an administrative nature in Majestri is the Administration tab. You can then click on the + New Committee button as shown below. You will be asked for some basic information about the committee - the name (our recommendation is to include the year as part of the name for future reference) and the active lifespan of this committee. Whichever end date you select, the members of this committee will lose their privileges at midnight on that day. You will then be presented with the Committee Boardroom. 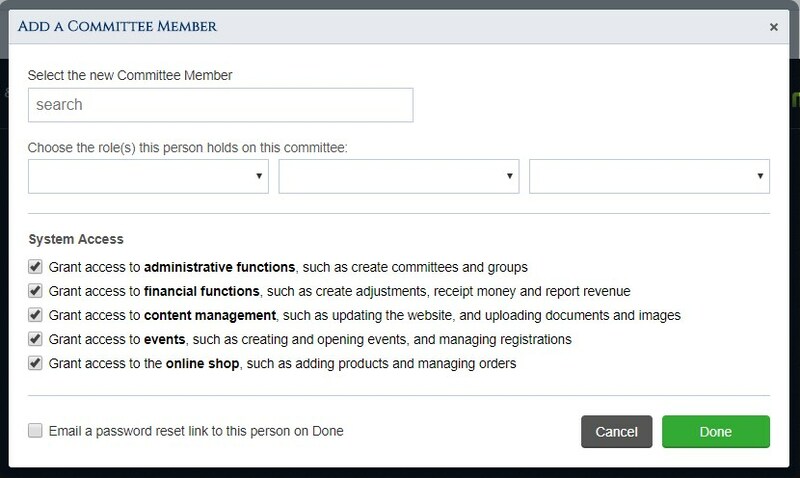 Once you elect to Add a Committee Member, you will be present with a popup that outlines what role this person has on the committee, as well as what access you're giving them to the system. Let's break down each section of this popup screen so you can understand exactly what's going on. At this stage, your target committee member may or may not exist in Majestri. If they do exist already, then you can start typing their name and you'll see it appear in the list as you type. Just select their name once you see it. If the person doesn't already exist in Majestri, then just finish typing their name. You will see that even though there are no matches, you still have the ability to create them 'on-the-fly' as a user of the system. You get the ability to specify a couple of their core details in-situ. After you've picked your person, you can outline up to 3 roles that they will hold on the committee. Ideally, each person will have one role, but a lot of smaller clubs have valuable volunteers that hold more than one post, so the system will let you reflect this. From a security perspective it makes absolutely no difference - the multi-role approach is purely for when the system prints out the committee details publicly on your behalf. Administrative - Encompasses the ability to themselves manage committees and groups, as well as control general system settings and email preferences. Financials - Essentially a treasurer's role that spans the entire Financials tab in the Control Room. Content - Entails being able to update the website as well as access to the Document and Image Vaults. Events - Anybody with this permission is allowed to configure and run events. It's essentially the same level of privilege as an 'Event Coordinator' assigned to an individual event, but applies to an event automatically. Online Shop - Is the ideal access for a Uniform Convenor who will just manage orders. This permission does not come with the ability to receipt payments from people. We've been around long enough to know that after you add somebody new to the committee, you want to tell them they can now get themselves a password and log into the system. 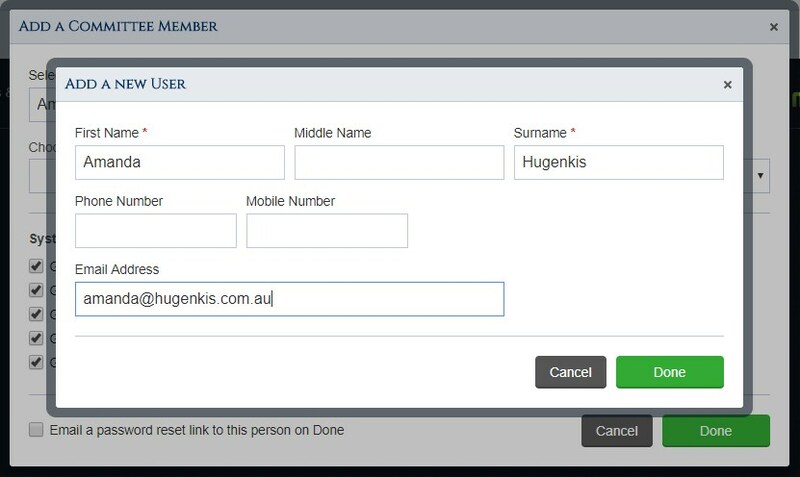 Checking the box at bottom left will automatically trigger the sending of the Password Reset notification to the email address of the committee member you've just added. If you'd like to wait until you invite them in, then you can just follow the guidance as outlined here to get them into the system down the track.